Why Cluns? Or first we should ask, why sheep? If we look at the price received for our meat products here in Nova Scotia over the last few years, we see that lamb has consistently brought in more than A1 steers and pork, even in the fall when the large numbers come forward. This, of course, is not the whole picture, but first glance gives the sheep a good advantage. Overproduction would soon depress the price, and greater skill, I am convinced, is required in raising sheep than (certainly) steers. Now, why Cluns? Being near the ocean, we Nova Scotians have summers which are not extremely hot, and in most years there is adequate rain and heavy dews to ensure a good growth of pasture. Couple this with small farms with irregular-shaped fields and everything points to a breed of sheep that can produce lambs off the ewe on pasture. Leave the Suffolks and the Hamps to the grain-growing provinces and states; here the ideal ewe is what is called in the U.K. a hill breed, and that is what the Clun is. 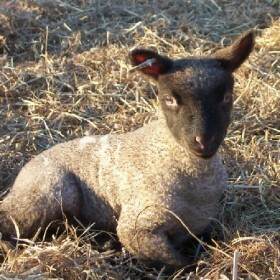 The competition to the Clun is the Halfbred (Leicester X Cheviot) or the Grayface (Leicester X Scottish Blackface). 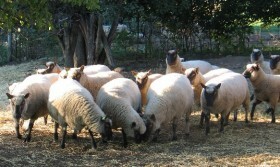 To maintain a flock of crossbreds you must either produce them yourself or buy them. Producing them means maintaining a flock of each of the crossing breeds or at least a flock of the ewe breed and buying rams of the other. Purchasing means having a source of replacements, something that is not always there as those producing the best usually have their own regular customers. Continually buying replacements brings with it the possibility of introducing disease. Why did I choose purebred breeding? For the same reason as have many others, I imagine­ the challenge. But here I differ from many other purebred breeders. To me the only purpose of a purebred breeder is to maintain and improve his chosen breed and subsequently provide a source of genetic material for the commercial farmer. To me the showring is of no concern. The sheep show, which originally served the purpose of fixing breed characteristics, has in North America outlived its usefulness. You only have to look at the ribbon-winning Dorsets­ they now look more like Columbias, and people wonder why they don’t breed year-round any more! Also, I have a growing concern about the part played by the show ring in the spread of disease. More than half the rams we sell go to commercial breeders who have discovered the Clun ram’s ability to produce valuable and easy-lambing crossbred females. But sales do not happen overnight. It has taken a long time to build up a reputation for the breed, but we have found that a satisfied customer is the best advertisement. The Nova Scotia Purebred Breeders Association annual sale has been established on quality standards and health inspection standards which are appreciated by the commercial farmer, especially now that much of our lamb is marketed by our own farmer’s cooperative. And health is a very serious concern. Nova Scotia is almost an island and has a very good health record. Problems still crop up, but I have observed that most occur with those who buy and sell large numbers of sheep. The recurrence, even here, of health problems has led me to the conclusion that we must maintain a closed flock in so far as that is possible. We isolate any incoming animals until we are sure that they are not harboring any infection. All animals are wormed, sprayed and blood-tested for Maedi (OPP). In addition, our permanent flock is blood-tested for Maedi annually, as well as being vaccinated for clostridial diseases. Moreover, all deaths without obvious cause are routinely postmortemed. However, the main weapon we use against health problems is good management practices. The groundwork for establishing Cluns in Nova Scotia is completed. Most sheep breeders in the province now know of the Clun breed and have heard of its good points. Many have already tried Clun rams. The challenge from here on is to increase Clun numbers so that pens of good-quality purebred females are available at our sales and for private sale.